Dystoria is a diabolical zero-g space labyrinth in which you are trapped as an experiment. 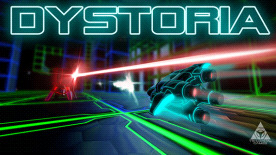 Combining a unique style of axis shifting gameplay with action packed space battles, stunning visuals and mind-bending level design, Dystoria will challenge you in a whole new way. In Dystoria your hover ship skims along any surface in any direction. Go ahead, hover up the walls, the ceiling, inside, outside. There's no such thing as up-side-down in Dystoria. Abducted to a distant galaxy by a mysterious organization called Omniam, you are given a hover ship and placed in a strange zero-g labyrinth where you are forced to destroy hordes of robotic insectoid enemies, solve puzzles and prove humanity's place in the galaxy. There are hidden areas and items all throughout Dystoria. Collect them all to unlock better ships, upgrade weapons and earn achievements. There's no shortage of enemies in Dystoria with increasing amounts as you progress. Some, like you, are locked to the surface, some are not and will require clever piloting to line them up. Or if that's not your style, just buy a bigger gun. Different weapons not only give you more firepower, they enhance the way you engage enemies. Can't hit those NATs and Seekers hovering over you? Get homing missiles and show them who's boss. Or better yet, clear the area with a proximity blast. Prefer to snipe from a distance? Equip a Speed Burst and Laser Canon. Prefer to go in with guns blazing? Rockets are your best friend. Choose from an inventory of 9 unique ships, unlocked by collecting salvage from your enemies destruction or by finding hidden pieces throughout each sector. Each ship has unique speed, maneuverability and shield, to fit your playing style. Copyright 2017 Tri-Coastal Games - All rights reserved.